PHP is a programming language commonly used to design web pages. OUTSOURCING WEB SOLUTION provides economic PHP outsourcing services. 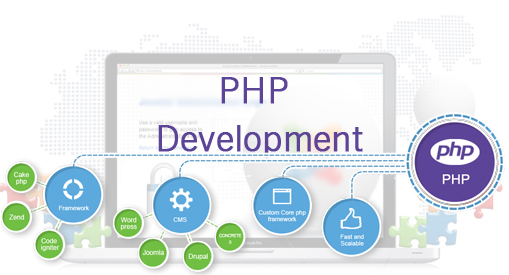 We are tagged as the leading service provider of PHP development services. We offer end-to-end PHP web development solution and also the customized solution by understanding your requirements. PHP is the preferable language of the designers and developers. It is perfect web solution with rich features. PHP websites are fast and safe websites contains smart web applications. By using full functional value of PHP, one can make perfect end product, which meet requirement of the customer. Our designer team always kept them up-dated with latest technology and able to provide desirable result. Our team of designers is make them prepared with newest PHP code lists to serve the clients with effective job. easy and simple : PHP application development is the strong and efficient language to build web sites in which application may progressively twist to meet clients requirements and get desired result. So PHP language can easily customize. SEO friendly: our outsourcing PHP development services make SEO friendly websites and facilitate to improve website ranking. Open source: PHP is open source language which can be used royalty free. It is backed by group of designers and PHP developers who build a platform by supporting each other with frequent updates. Ideal benefits of PHP made it best option for web application to make shopping cart, social networking sites, CMS, CRM and enterprise solutions.